for guests wishing to play golf but also enjoy sun and sea in the tranquillity of a small private beach. Located in the village of Puntaldia, Due Lune Golf & Spa Resort is situated a few kilometers from San Teodoro and about 30 km from Olbia Costa Smeralda Airport. Due Lune Golf & Spa Resort enjoys a special position near the sea, not far from the most beautiful beaches of the area, like the famous beach of La Cinta. The hotel blends harmoniously into the natural environment that surrounds it and offers splendid views of the coast of Puntaldia. The 66 comfortable rooms of Due Lune Golf & Spa Resort are decorated in the typical style of the Mediterranean regions and are equipped with every comfort. They are located either on the entrance floor of the hotel or on the garden level and are overlooking the sea or the fragrant garden. Standard - some rooms are refurbished. All rooms have minibar, air conditioning, safety-box, satellite TV, balcony or terrace. In some rooms there is the possibility to add a third bed. 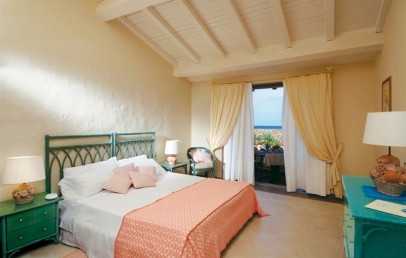 Deluxe seaside - All rooms are refurbished. All rooms have minibar, air conditioning, safety-box, satellite TV, balcony or terrace. In most of these rooms possibility of a third bed. In the spare time, besides the beach, the Due Lune Golf & Spa Resort offers numerous sports and recreational activities, among which guests can find: swimming pool, gym, four tennis courts, two diving centers and the possibility of sailing and windsurfing. Golf lovers have the possibility to play at the own Golf Club Puntaldia. The guests of the Due Lune Golf & Spa Resort enjoy the finest service of the restaurant, which serves highest level dishes. The choice ranges from regional dishes to national and international recipes, always arranged with the professionalism and precision characterizing the staff of the hotel. The hotel has a private beach is for the hotel guests. The hotel also has two fully equipped meeting rooms. Double room on the first floor of the Hotel or on garden level. The furniture are different from one room to the other but all of them are warm and cozy with a lively style, elements of Sardinian tradition and elegant colours that recall those of the sea and earth. Every room has a balcony or patio. 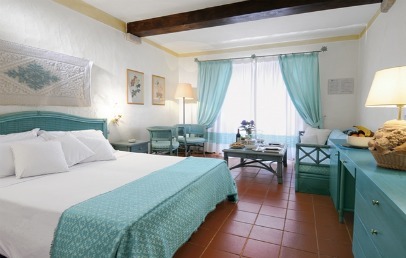 Renovated double room on the first floor of the Hotel or on garden level. The furniture are different from one room to the other but all of them are warm and cozy with a lively style, elements of Sardinian tradition and elegant colours that recall those of the sea and earth. Every room has a balcony or patio. Special Charming reduction for reservations confirmed within April 30th 2019!